Observation - Snow-blown Blackcap - UK and Ireland. 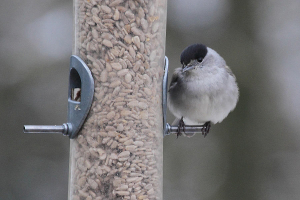 Description: In our latest spell of typically British spring weather, first the Siskins returned to our feeders and today they were joined by our first Blackcap of the season. Good job there's some advantage to terrible weather. In our latest spell of typically British spring weather, first the Siskins returned to our feeders and today they were joined by our first Blackcap of the season. Good job there's some advantage to terrible weather.